The MetLife Middle School Principal of the year in 2013 spent eight years turning around her Title I school in a suburb of Atlanta, GA with historically low performance. Principal Barron knew that she needed to make some major changes, but she wasn’t sure where to start. She recognized that she needed to focus the school on a few areas of improvement to make progress. Ultimately, she focused on four things – in sequential order over eight years – to get tremendous results for students. By 2013, her students were achieving above the state average, and her team had eliminated achievement gaps for students with disabilities in math. Her focus (in order of almost exclusive priority) were to 1) get kids to school, 2) keep kids safe, 3) build relationships, and 4) focus on teaching. In considering your priorities, consider this focusing question from “The ONE Thing” by Gary Keller (of Keller-Williams Real Estate) and Jay Papasan – “What’s the ONE thing you can do, such that by doing it, everything else will be easier or unnecessary?” In other words, what is the comparatively highest leverage strategy you can put in place to get better results? Following their methodology with purity, you don’t get permission to move to your next priority until the first is not only achieved, but it is also on the way to being sustained – exactly what Principal Barron and her team did. 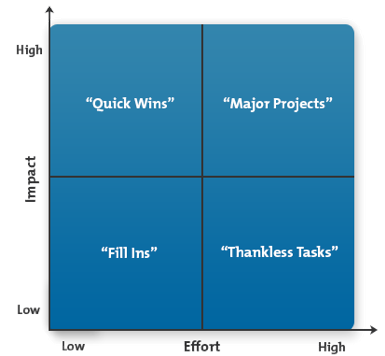 To help reach clarity on your one priority, consider using a 2×2 matrix exercise to identify the relative impact and effort required for potential priorities with your team. Avoid the “thankless tasks” that are high effort and low impact, and include some “quick wins” on the way to accomplishing “major projects”.